The middle part of a trilogy must be a daunting challenge for any writer. In whatever form they are working in, it is always the bridge. When you are working with the scope of The Parachute Regiment’s experience in the Second World War, the decision making process must be brutal. 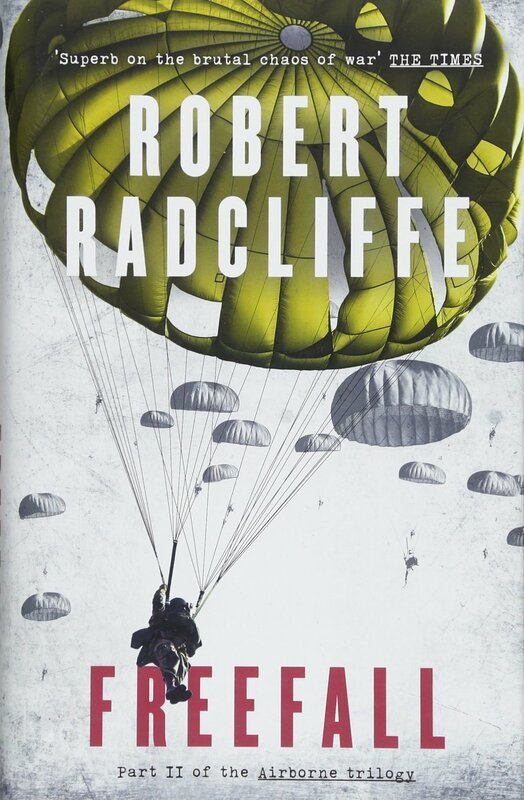 In the second part of Robert Radcliffe’s Airborne Trilogy, Theo Trickey will continue his fight and Daniel Garland will continue to try to unpick how Rommel fits into Trickey’s life. Freefall opens just after the events of Airborne, with the start of Operation Biting and the mission to steal the German radar technology at Bruval. Trickey is tasked with managing the captured Germans with the order, should the mission fail, to ensure that none are left alive to explain what C Company was up too. Trickey has to battle with this conscience and finds Major John Frost’s order hard to follow. But the mission, as history shows, is a success and the Paras find themselves shipped off to North Africa for some brutal fighting that will shape the future of the regiment. In Germany, a couple years later, Garland is settling into life as a POW. His doctors status affords him more liberty than his fellow POWs. He journeys around and through an increasingly destroyed Germany, clandestinely caring for civilians caught in the middle. As Trickey slowly recovers, Garland finds himself drawn further into Rommel’s circle, even though the Field Marshal is now dead. Robert Radcliffe has a wonderful style of writing. His prose conveys a depth of emotion and through this is able to capture the conflict in his hero, especially as Trickey returns to an Italy in revolt. Throughout his novels, Radcliffe captures the violence and confusion of battle, then sensitively narrows that down to the impact on his characters. In Garland, Radcliffe has almost a Central Casting supplied British Officer, which I think was his point. His thawing of Garland as the reality of what the German populace is facing sinks in is sensitively done. With Trickey, he has a fiery Latin trying to fit in with the British ideal that his mother created of his tricky father. While I am enjoying this series very much, Freefall does suffer from Radcliffe trying to squeeze in a tad too much story. Trickey is rushed about at a great rate of knots and at times it does feel like a condensed history of The Parachute Regiment in North Africa (“Whoa Mohammed”!). While the Garland story line has a better pacing, by the midpoint of the novel, Theo Trickey has been fully fleshed out as a character. Before now he has felt very much a cipher but in Freefall, we really do get know Trickey as his past starts to be shown to us and his decisions make more sense. A trilogy is a tricky thing to pull off. So far, Radcliffe has brought the style of his previous novels to bear her and, with the larger canvas of Theo Trickey’s war, is painting an impressive picture. But with Normandy and Arnhem to come, sticking the landing will not be easy but we will finally see Garland and Trickey meet in a stinking hole in the middle of a hellish battle. I have faith in Radcliffe and am looking forward to see how he ties off all the threads he has weaved so far. Freefall by Robert Radcliffe is out now from Head of Zeus (RRP £18.99), who kindly provided this review copy.